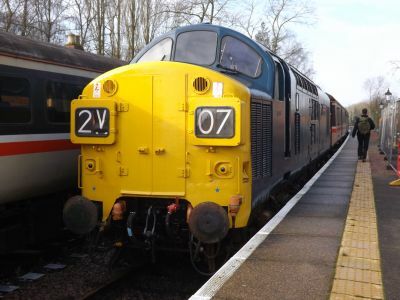 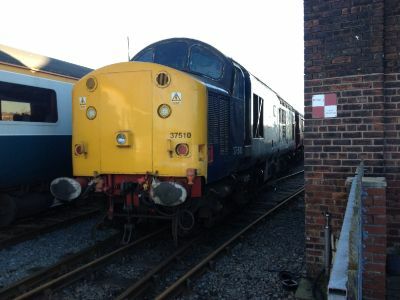 37218 tnt 37609 3Q69 2230 Ipswich H.S. 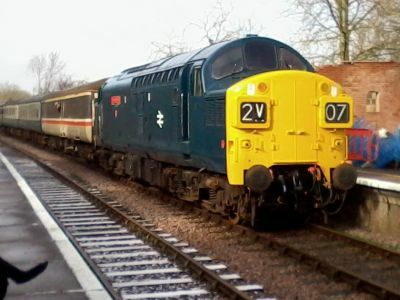 - Norwich - Harwich Town - Ipswich H.S. 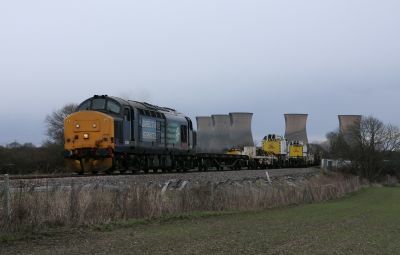 57007 tnt 37425 6C51 1258 Sellafield B.N.F. 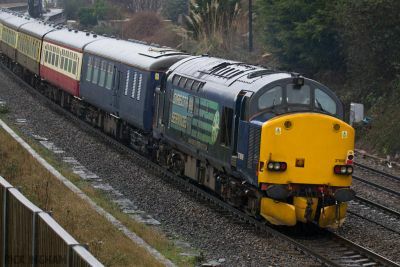 - Heysham Harbour P.S. 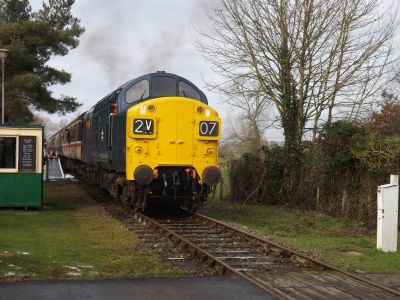 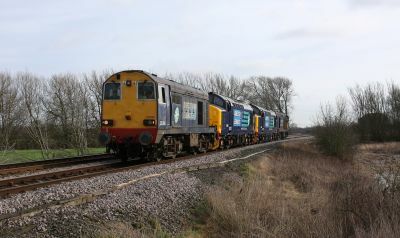 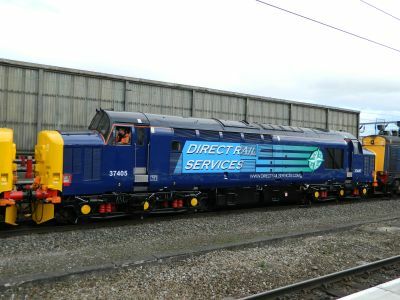 37610 3Q04 1842 Derby R.T.C. 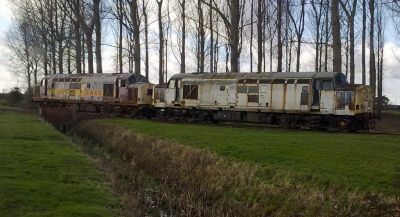 (Network Rail) - Crewe - Landore T.M.D. 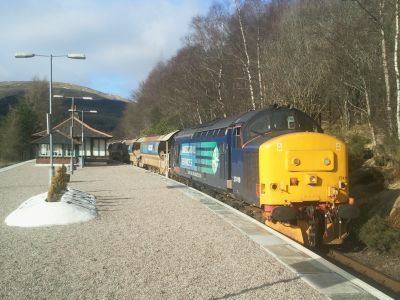 6K60 1410 Glenfinnan - Fort William J.Yd T.C. 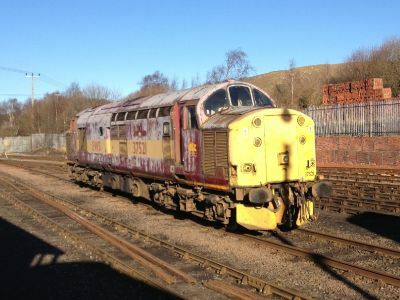 6K60 1230 Mossend Down Yard - Fort William J.Yd T.C. 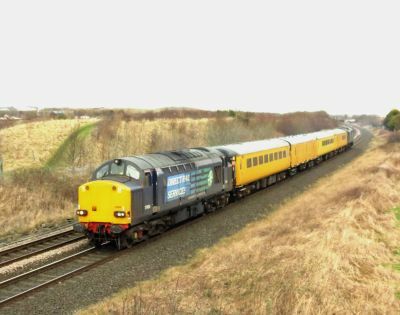 37667 + 37612 6C53 0630 Crewe Coal Sidings (Drs) - Sellafield B.N.F. 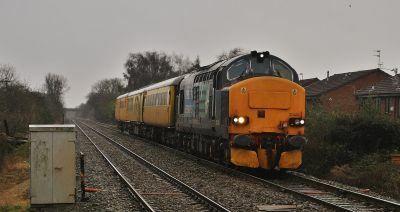 37425 tnt 37259 6C51 1258 Sellafield B.N.F. 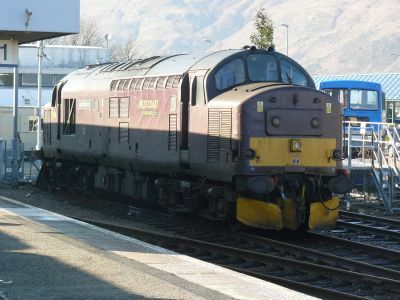 - Heysham Harbour P.S. 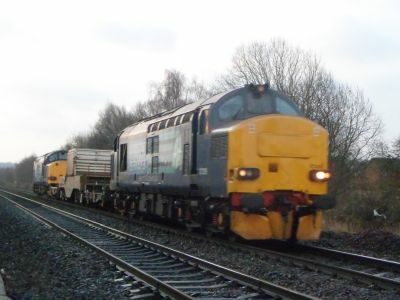 37605 + 37610 6C53 0630 Crewe Coal Sidings (Drs) - Sellafield B.N.F. 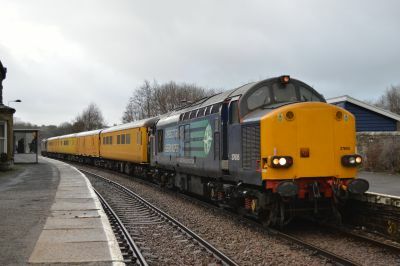 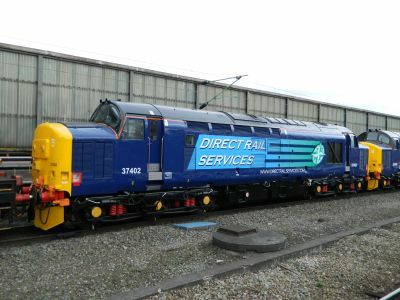 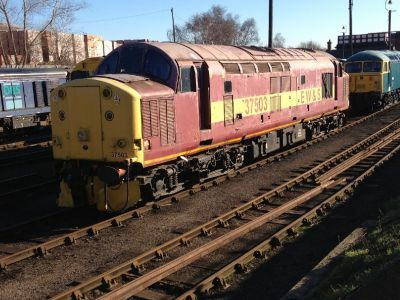 37601 3Z01 1909 Derby R.T.C. 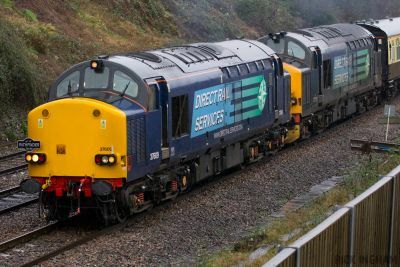 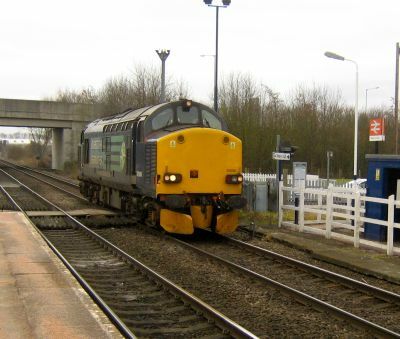 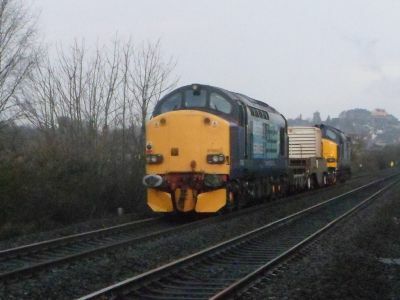 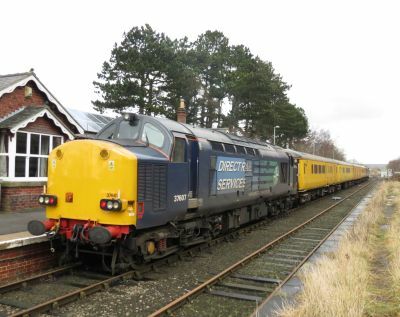 (Network Rail) - Falkland S.S.
37685 tnt 57304 6Z59 1500 Kilmarnock Bonnyton Depot - Yoker C.S. 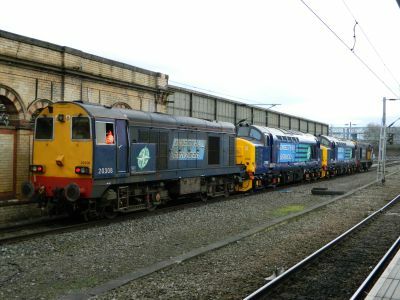 37602 + 37261 6C53 0630 Crewe Coal Sidings (Drs) - Sellafield B.N.F. 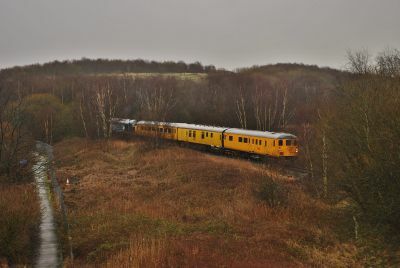 6C51 1258 Sellafield B.N.F. 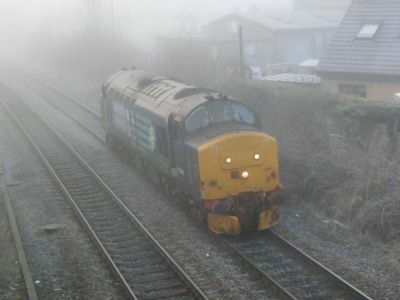 - Heysham Harbour P.S. 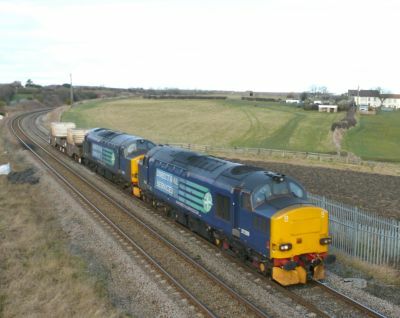 0C52 1605 Heysham Harbour P.S. 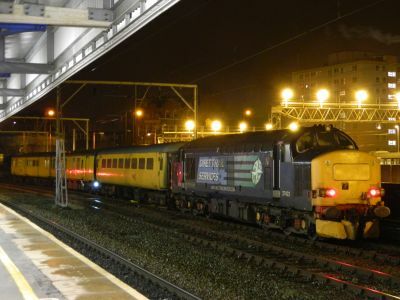 - Sellafield B.N.F. 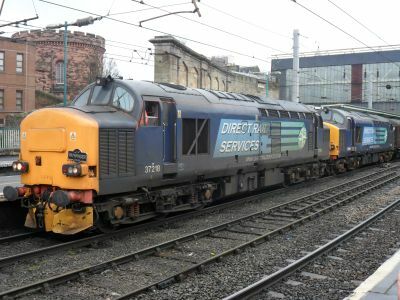 37423 3Q16 1828 Mossend Down Yard - Glasgow Central - Inverness T.M.D. 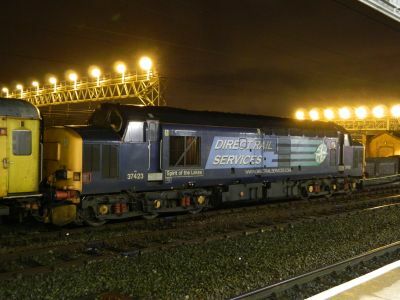 37607 + 57010 6C53 0630 Crewe Coal Sidings (Drs) - Sellafield B.N.F. 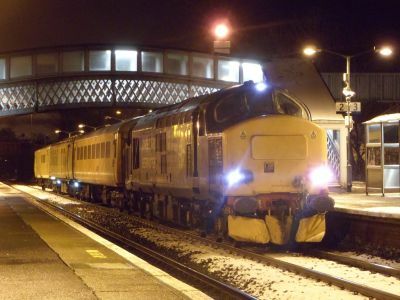 1Q90 1347 London Fenchurch Street - Leigh-on-sea - East Ham E.M.U.D. 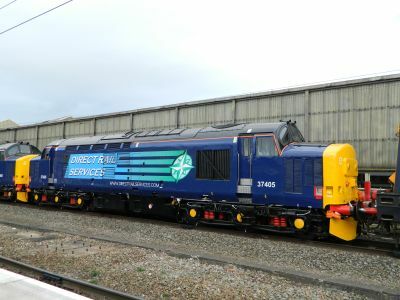 4S44 1213 Daventry Drs (Malcolm W H) - Coatbridge F.L.T. 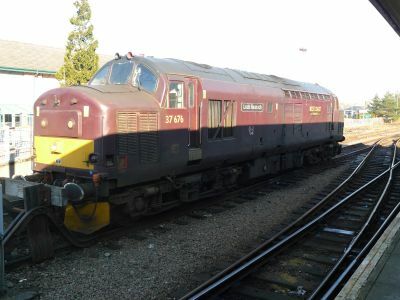 1Q52 1624 London Liverpool Street - Barking Upney Junction - East Ham E.M.U.D. 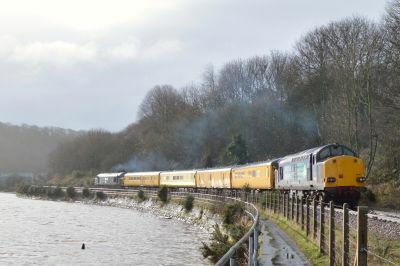 97304 tnt 31105 3Z01 1002 Exeter Riverside N.Y. - Exeter Tmd - Exeter Riverside N.Y.
3Q01 1534 Exeter Riverside N.Y. - Goodrington C.H.S - Heathfield E.C.C. 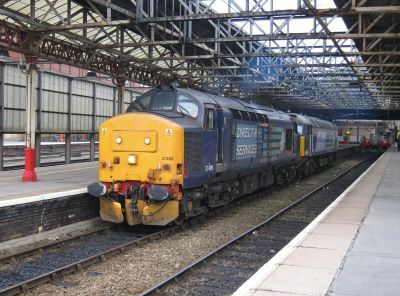 - Exeter Riverside N.Y. - Exmouth - Exeter St Davids - Laira T.& R.S.M.D. 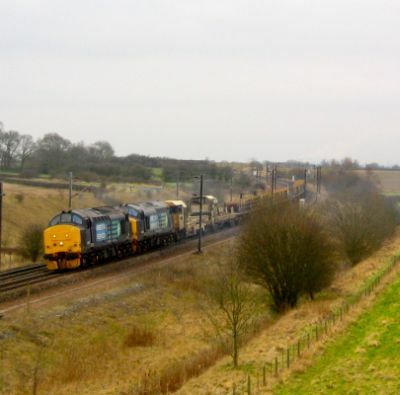 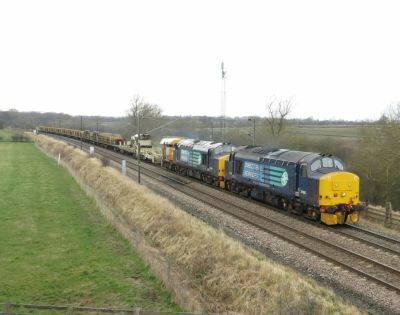 37259 tnt 37602 6S99 0437 Carlisle Kingmoor Sdg(Drs) - Georgemas Junction C.E. 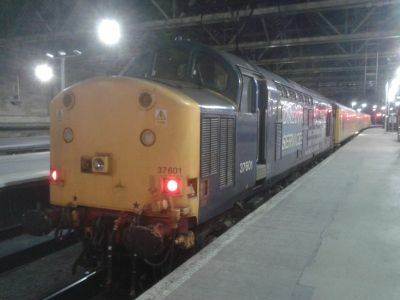 1Q49 1150 London Liverpool Street - Norwich - Norwich Stn C.S.D. 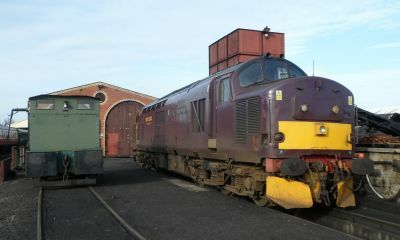 97304 tnt 31105 3Q01 1754 Derby R.T.C. 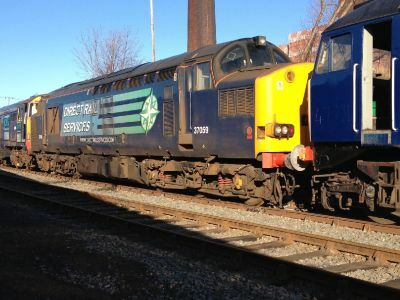 (Network Rail) - Exeter Riverside N.Y.
47501 + 37601 6C53 0630 Crewe Coal Sidings (Drs) - Sellafield B.N.F. 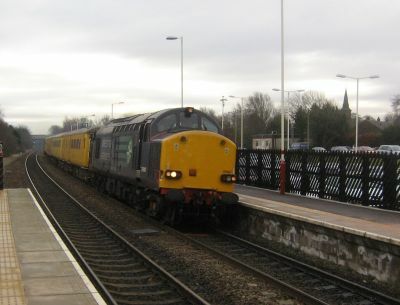 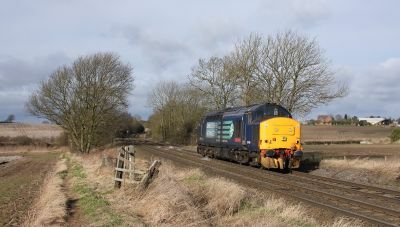 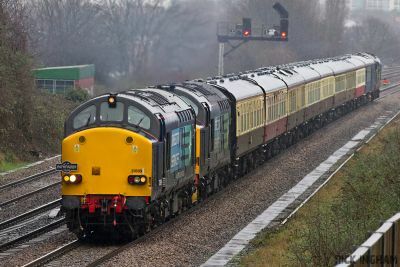 37423 3Q04 1013 Crewe C.S. 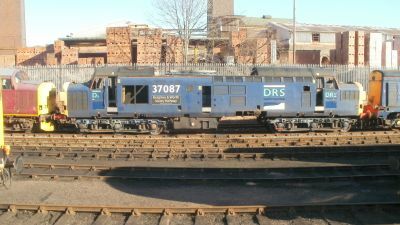 (L&Nwr Site) - Tyseley T.M.D. 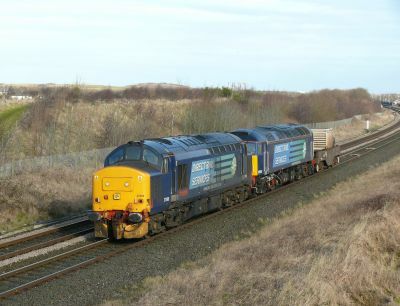 37606 + 37611 6C53 0630 Crewe Coal Sidings (Drs) - Sellafield B.N.F. 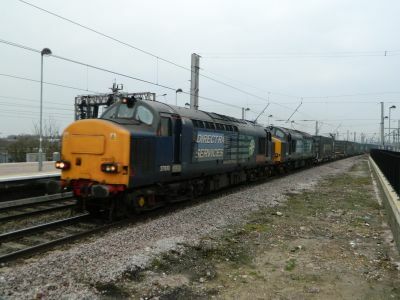 57310 + 37409 + 37682 6C53 0630 Crewe Coal Sidings (Drs) - Sellafield B.N.F. 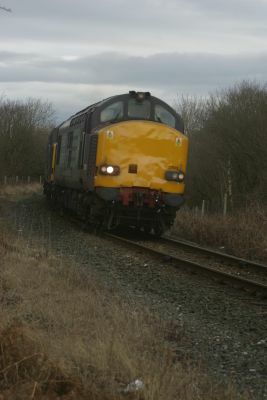 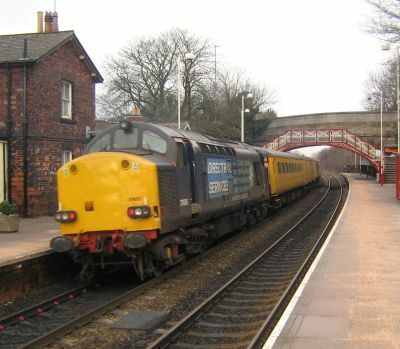 37409 + 57010 0C51 1258 Sellafield B.N.F. 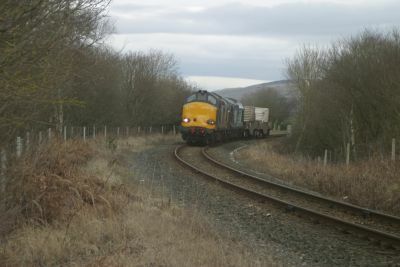 - Heysham Harbour P.S. 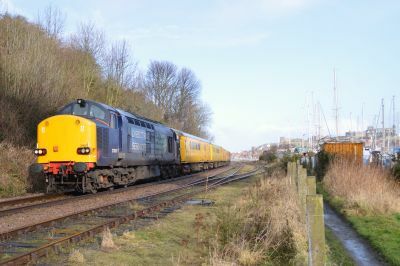 37409 tnt 57010 6C52 1605 Heysham Harbour P.S. 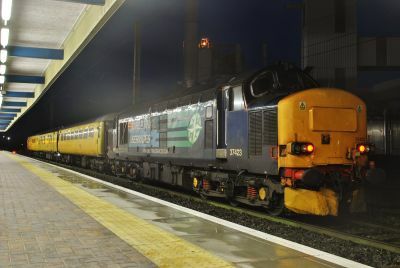 - Sellafield B.N.F. 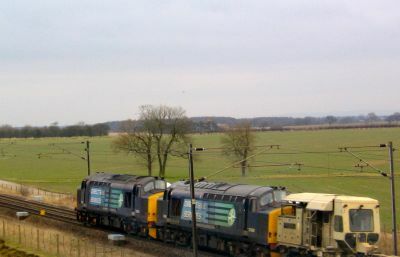 37605 tnt 37607 1Q13 0648 York Holgate Sidings - Whitby - Darlington - Bishop Auckland - Darlington - Heaton T&R.S.M.D.